Night view of the palace. For more pics about my travel clicks, click here. I have been seeing lots of photos of the Hoysala architecture through other photographers’ eyes. But never had an opportunity to admire the wonder through my eyes till few days back.It was a great pleasure watching and capturing these lovely sculptures lively. Had one of the most amazing time as a nature admirer. Love our country’s history. For more pictures click here. 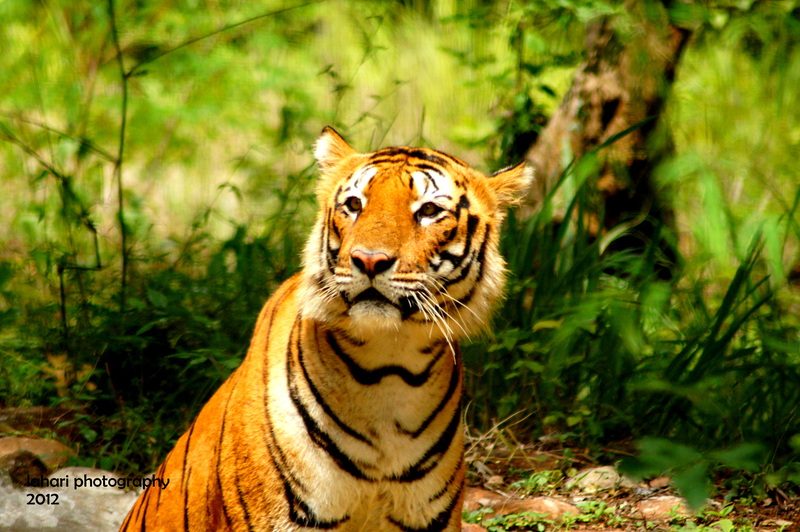 This is my first trip to Bannerghatta national park. I really wanted to go to the safari ride and see what is in store for me. Yes, my wishes came true. Was really really excited and happy to see every now and then, I was being said so and so animal is there to your left, right , center. The clicking started and the day has finally started getting its actual meaning. My camera felt so happy, it gave me some amazing shots in return. 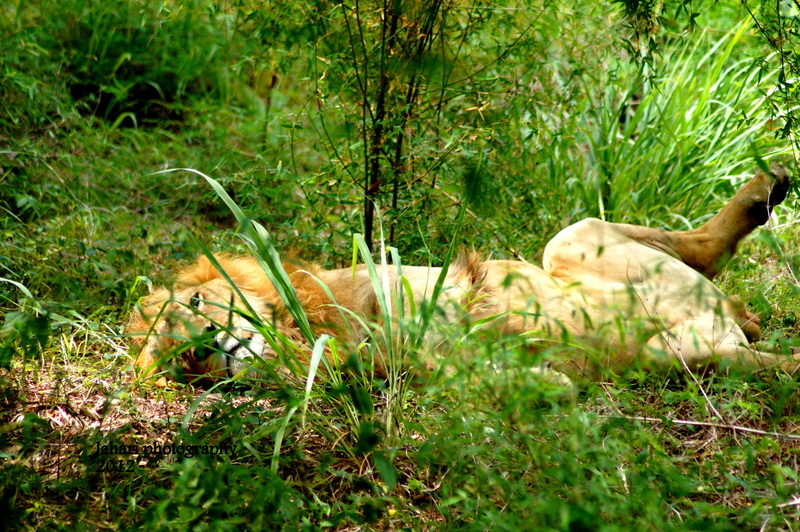 Among all the animals I happen to see, the laziest was the lion. Wanna see how he was actually lying down!! Following the lazy fellow, double gates, we entered the white tigers’ section. The driver was really unfair with me this time. Every stop he made, the trees blocked and I couldn’t take good pictures. Finally I screamed to stop at my perfect location with loads of please and stops. My voice finally reached him and loads of thanks now. He stopped at the perfect spot and the clicks continued. This time, it was literally a stunner show for our eyes. 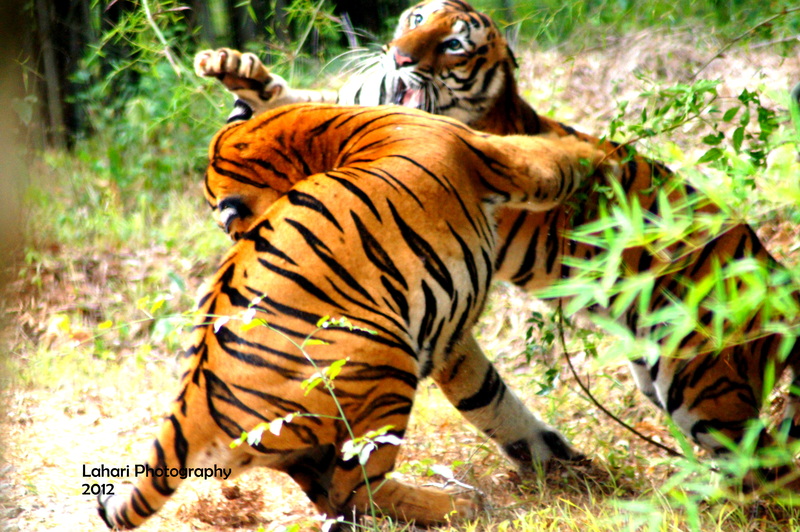 We spotted two tigers and they gave a complete show for us. 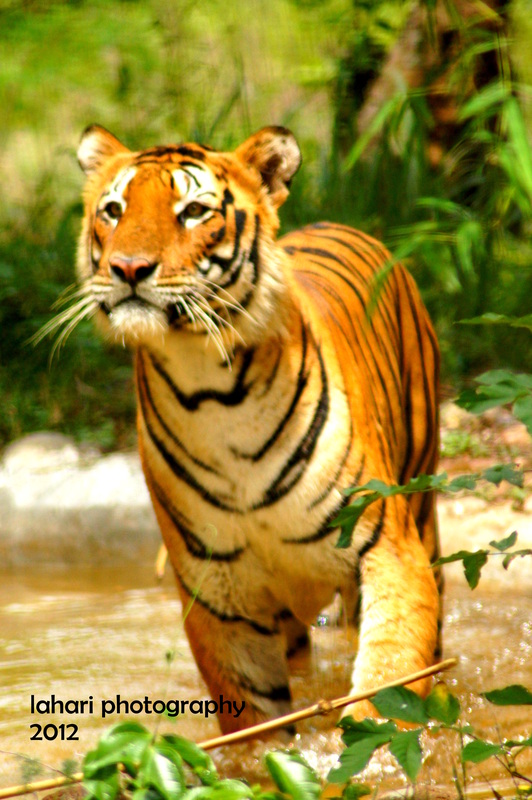 The tiger first saw his/her partner ( I start with his) and started walking towards her. 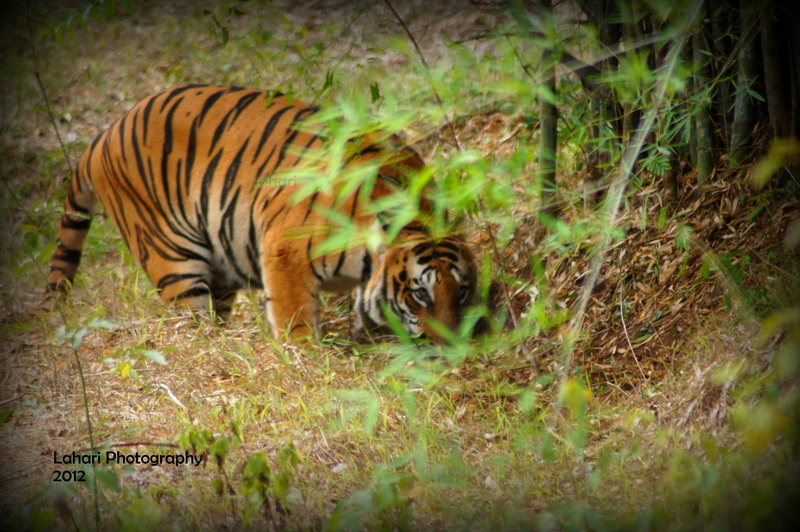 The tigress was hiding behind and watching him. Slowly there was a roar which kept on increasing and commanding at him for entering her territory. 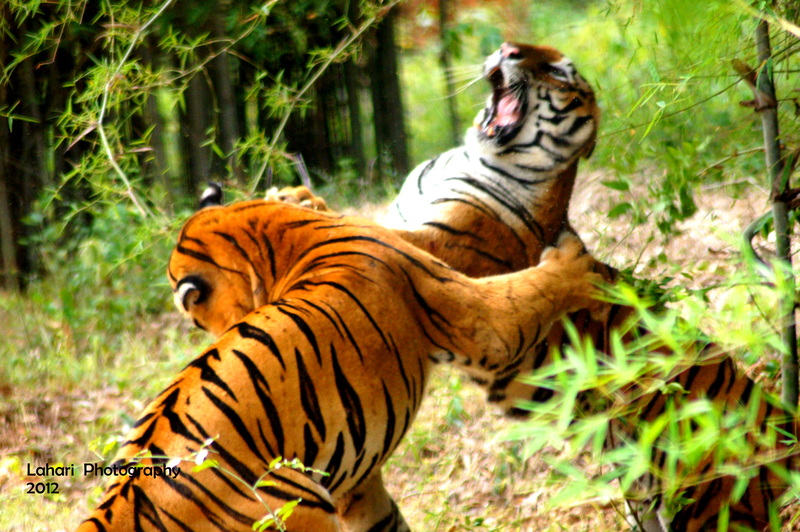 When he tried to move further, she gave him a tight slap for entering into her territory. 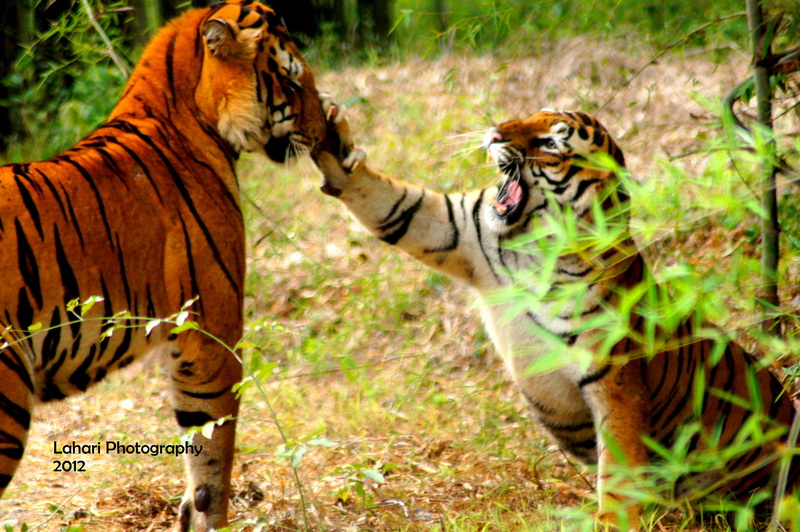 Later when I asked my hubby ( a veterinarian) for that rude behavior, hubby told me that the tiger is either trying to mate with her or its sign of not to invade its territory (so truly wild). The hitting and rolling started and like every old Indian film, the remaining scenes were censored ( for here the driver drove the van from that place). For sure, the pictures that were captured will remain as a great memory for me. Copyrights reserved for all the pictures. If you want to use these pictures, please contact me first at lahariphotography@gmail.com. Vote for my photo at MAY THE BEST PHOTO WIN Click here. The picture I have posted for the contest is posted below. Colorful wooden toy car.